The MacDonalds of Glengarry are frequently known as MacDonnell of Glengarry, indeed there are various spellings of this name depending on the source (including 'Donel, 'Donnel, 'Donell) but all are descended from Donald of Knoydart, 2nd son of Ranald (progenitor of Clanranald). When the Lordship of the Isles was absorbed by the Crown in 1493 the unity of the MacDonalds failed and the branches were left as independent clans. Prolonged and extensive disputes regarding seniority and legitimacy ensued among the families of Clan Donald until the Restoration of Charles II in 1660, when the title of 'Lord MacDonell and Aros' was bestowed on Eneas, 9th of Glengarry and heir to the line of Celestine of Lochalsh. Glengarry was recognised by the Government as Chief of Clan Donald, but the chiefship again fell dormant when he died in 1680 devoid of male issue and only the Glengarry chiefship passed to his cousin, MacDonald of Scotus. As representative of a fiercely Jacobite clan, the heir to the chiefship in 1745 was elected to carry an address of support to Prince Charlie in France, but was captured en route and held in the Tower of London for the duration of the Rising and, although the Chief remained aloof from any involvement, the clan under his 2nd son, Angus, gave an account of themselves second to none in the martial events of the time. Their contribution did not go un-noticed by 'Butcher' Cumberland and the Glengarry lands received considerable attention from his marauding troops. The extravagance of the 15th Chief, Alasdair Ranaldson MacDonell of Glengarry, friend of Sir Walter Scott and subject of Raeburn's famous portrait, led to the sale of the ancestral lands but the now ruinous Invergarry Castle, the 'Well of the Heads' and the family burial ground remained with the family. 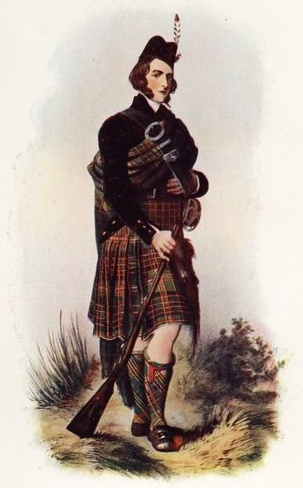 His son (16th chief) emigrated with his family and many of his clan, but returned to settle in Knoydart. On the deaths of his two sons, the 17th &amp; 18th chiefs, without issue, (the latter in 1868), the chiefship passed to Aeneas, 7th of Scotus.